Click to download a copy from Facts & Figures / Presentation Materials! This is the Cleveland Clinic Narrative – the long-form description of our organization that was created by our caregivers and differentiates us from other hospital systems. 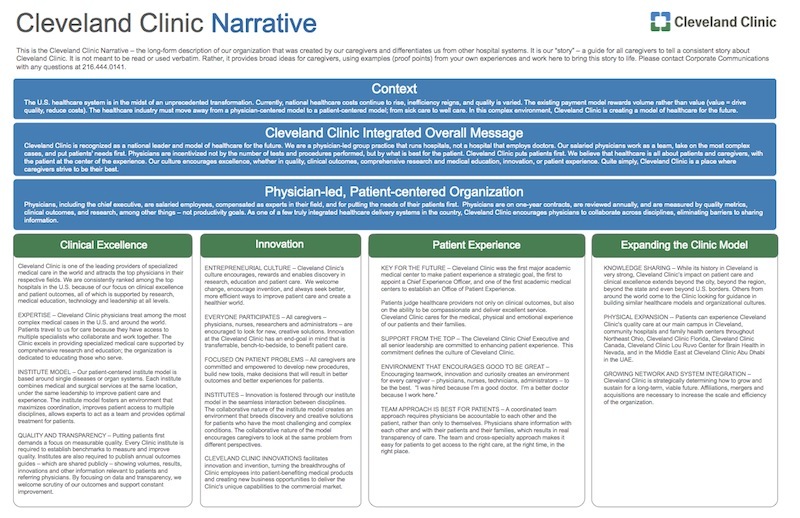 It is our “story” – a guide for all caregivers to tell a consistent story about Cleveland Clinic. It is not meant to be read or used verbatim. Rather, it provides broad ideas for caregivers, using examples (proof points) from your own experiences and work here to bring this story to life. Please contact Corporate Communications with any questions at 216-444-0141. The U.S. healthcare system is in the midst of an unprecedented transformation. Currently, national healthcare costs continue to rise, inefficiency reigns, and quality is varied. The existing payment model rewards volume rather than value (value = drive quality, reduce costs). The healthcare industry must move away from a physician-centered model to a patient-centered model; from sick care to well care. In this complex environment, Cleveland Clinic is creating a model of healthcare for the future. Cleveland Clinic is recognized as a national leader and model of healthcare for the future. We are a physician-led group practice that runs hospitals, not a hospital that employs doctors. Our salaried physicians work as a team, take on the most complex cases, and put patients’ needs first. Physicians are incentivized not by the number of tests and procedures performed, but by what is best for the patient. Cleveland Clinic puts patients first. We believe that healthcare is all about patients and caregivers, with the patient at the center of the experience. Our culture encourages excellence, whether in quality, clinical outcomes, comprehensive research and medical education, innovation, or patient experience. Quite simply, Cleveland Clinic is a place where caregivers strive to be their best. Physicians, including the chief executive, are salaried employees, compensated as experts in their field, and for putting the needs of their patients first. Physicians are on one-year contracts, are reviewed annually, and are measured by quality metrics, clinical outcomes, and research, among other things – not productivity goals. As one of a few truly integrated healthcare delivery systems in the country, Cleveland Clinic encourages physicians to collaborate across disciplines, eliminating barriers to sharing information. Cleveland Clinic is one of the leading providers of specialized medical care in the world and attracts the top physicians in their respective fields. We are consistently ranked among the top hospitals in the U.S. because of our focus on clinical excellence and patient outcomes, all of which is supported by research, medical education, technology and leadership at all levels. EXPERTISE – Cleveland Clinic physicians treat among the most complex medical cases in the U.S. and around the world. Patients travel to us for care because they have access to multiple specialists who collaborate and work together. The Clinic excels in providing specialized medical care supported by comprehensive research and education; the organization is dedicated to educating those who serve. INSTITUTE MODEL – Our patient-centered institute model is based around single diseases or organ systems. Each institute combines medical and surgical services at the same location, under the same leadership to improve patient care and experience. The institute model fosters an environment that maximizes coordination, improves patient access to multiple disciplines, allows experts to act as a team and provides optimal treatment for patients. QUALITY AND TRANSPARENCY – Putting patients first demands a focus on measurable quality. Every Clinic institute is required to establish benchmarks to measure and improve quality. Institutes are also required to publish annual outcomes guides – which are shared publicly – showing volumes, results, innovations and other information relevant to patients and referring physicians. By focusing on data and transparency, we welcome scrutiny of our outcomes and support constant improvement. ENTREPRENEURIAL CULTURE – Cleveland Clinic’s culture encourages, rewards and enables discovery in research, education and patient care. We welcome change, encourage invention, and always seek better, more efficient ways to improve patient care and create a healthier world. EVERYONE PARTICIPATES – All caregivers — physicians, nurses, researchers and administrators – are encouraged to look for new, creative solutions. Innovation at the Cleveland Clinic has an end-goal in mind that is transferable, bench-to-bedside, to benefit patient care. FOCUSED ON PATIENT PROBLEMS – All caregivers are committed and empowered to develop new procedures, build new tools, make decisions that will result in better outcomes and better experiences for patients. INSTITUTES – Innovation is fostered through our institute model in the seamless interaction between disciplines. The collaborative nature of the institute model creates an environment that breeds discovery and creative solutions for patients who have the most challenging and complex conditions. The collaborative nature of the model encourages caregivers to look at the same problem from different perspectives. Cleveland Clinic Innovations (CCI) – facilitates innovation and invention, turning the breakthroughs of Clinic employees into patient-benefiting medical products and creating new business opportunities to deliver the Clinic’s unique capabilities to the commercial market. KEY FOR THE FUTURE– Cleveland Clinic was the first major academic medical center to make patient experience a strategic goal, the first to appoint a Chief Experience Officer, and one of the first academic medical centers to establish an Office of Patient Experience. Patients judge healthcare providers not only on clinical outcomes, but also on the ability to be compassionate and deliver excellent service. Cleveland Clinic cares for the medical, physical and emotional experience of our patients and their families. SUPPORT FROM THE TOP – The Cleveland Clinic Chief Executive and all senior leadership are committed to enhancing patient experience. This commitment defines the culture of Cleveland Clinic. ENVIRONMENT THAT ENCOURAGES GOOD TO BE GREAT – Encouraging teamwork, innovation and curiosity creates an environment for every caregiver – physicians, nurses, technicians, administrators – to be the best. TEAM APPROACH IS BEST FOR PATIENTS – A coordinated team approach requires physicians be accountable to each other and the patient, rather than only to themselves. Physicians share information with each other and with their patients and their families, which results in real transparency of care. The team and cross-specialty approach makes it easy for patients to get access to the right care, at the right time, in the right place. KNOWLEDGE SHARING – While its history in Cleveland is very strong, Cleveland Clinic’s impact on patient care and clinical excellence extends beyond the city, beyond the region, beyond the state and even beyond U.S. borders. Others from around the world come to the Clinic looking for guidance in building similar healthcare models and organizational cultures. PHYSICAL EXPANSION – Patients can experience Cleveland Clinic’s quality care at our main campus in Cleveland, community hospitals and family health centers throughout Northeast Ohio, Cleveland Clinic Florida, Cleveland Clinic Canada, Cleveland Clinic Lou Ruvo Center for Brain Health in Nevada, and in the Middle East at Cleveland Clinic Abu Dhabi in the UAE. GROWING NETWORK AND SYSTEM INTEGRATION – Cleveland Clinic is strategically determining how to grow and sustain for a long-term, viable future. Affiliations, mergers and acquisitions are necessary to increase the scale and efficiency of the organization.